ProQuotes has established thousands of data feeds for Quorum dealers across North America. The Dealer and the Vendor complete the ProQuotes Third Party Data Request. We recommend that the Vendor assist the Dealer in the completion of the middle section, especially the specifics of the data request and the connection information. 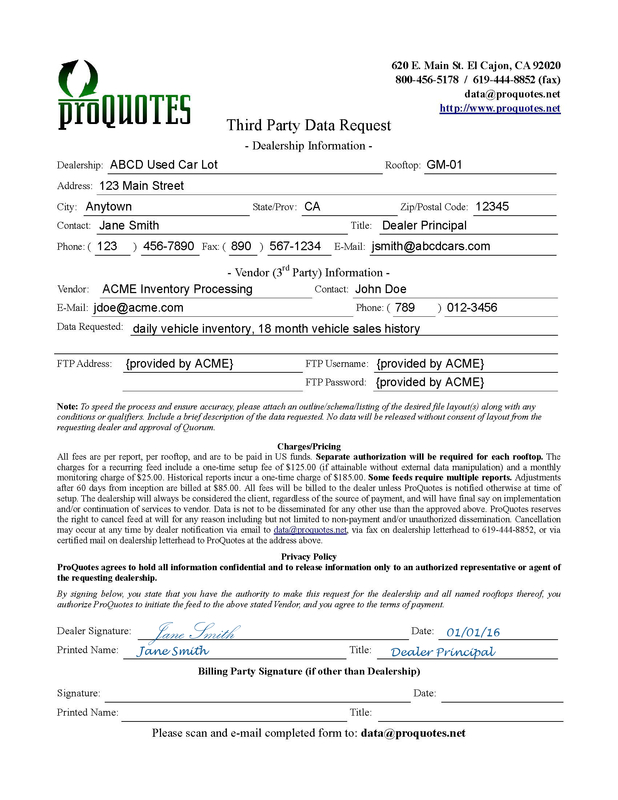 Either the Dealer or the Vendor return the signed form to ProQuotes at data@proquotes.net. The Dealer must sign the form in order to release the data. If the Vendor will be paying for the feed directly, the Vendor will also be required to sign the form. Please note that ProQuotes does not accept electronic signatures. ProQuotes reviews and processes the request. If additional information is required, ProQuotes reaches out to the Vendor/Dealer as necessary. Setup: a one time fee of $125 will be assessed at time of setup. Monthly Fee: a recurring maintenance fee of $25 will be assessed for each month after setup that the feed remains active. Modification: a one time fee of $85 will be assessed for any reprogramming which occurs after the initial 60-day grace period. This includes any adjustment to the schema, and any change made to the conditions imposed on the data. Historical: a one time fee of $185 will be assessed for each one-time report requested. All prices are on a per-file, per-rooftop basis. Some feeds consist of multiple files. By default, feeds will be billed to the dealership, unless an alternate party is indicated on and has signed the Third Party Data Request.